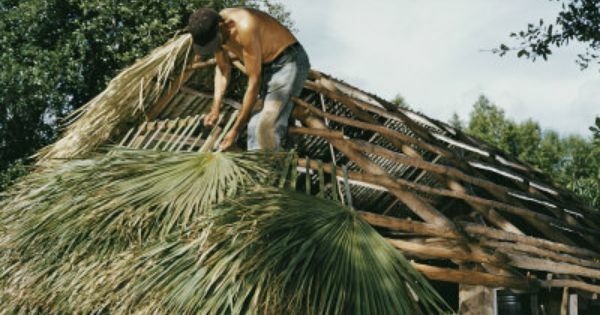 Does anyone have experience thatching a roof with fan palms? 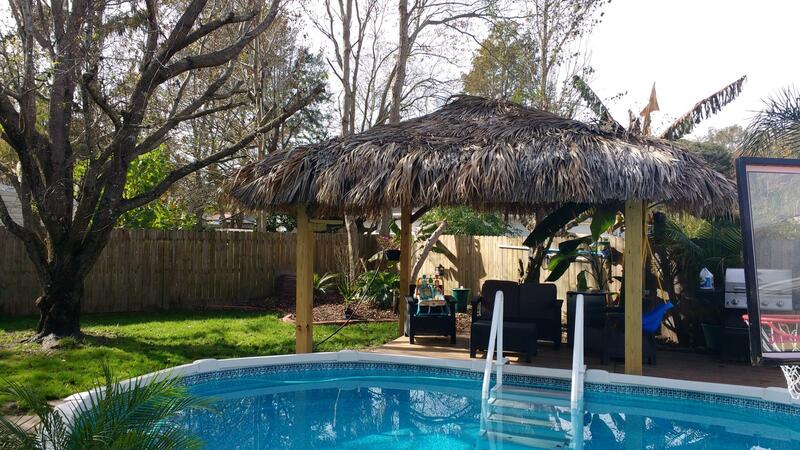 I am in the process of building a gazebo over part of my deck by the pool and would like to use real palms for the thatch roof. 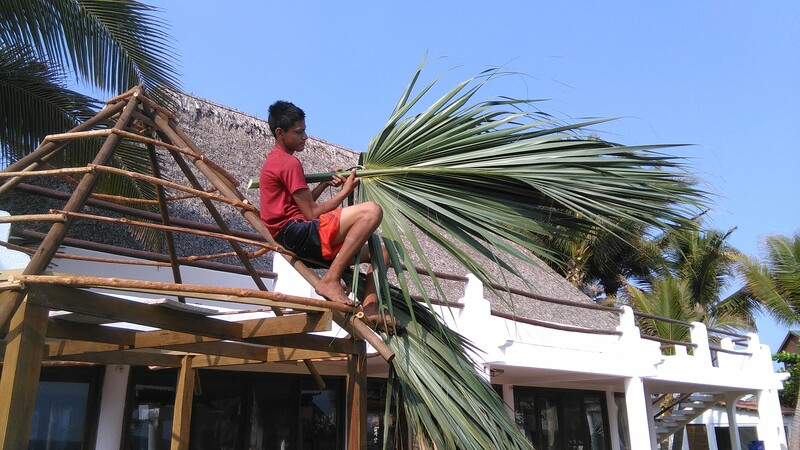 I have watched some youtube videos of the process for thatching a roof using fan palms. If anyone has done is and has suggestions to make the process easier please let me know. Its going to be tough to acquire all of the sabal palm leaves but my plan is to offer free palm trimming work in the surrounding area. Worst comes to worst Ill use synthetic thatch but I really want to use real palm leaves. 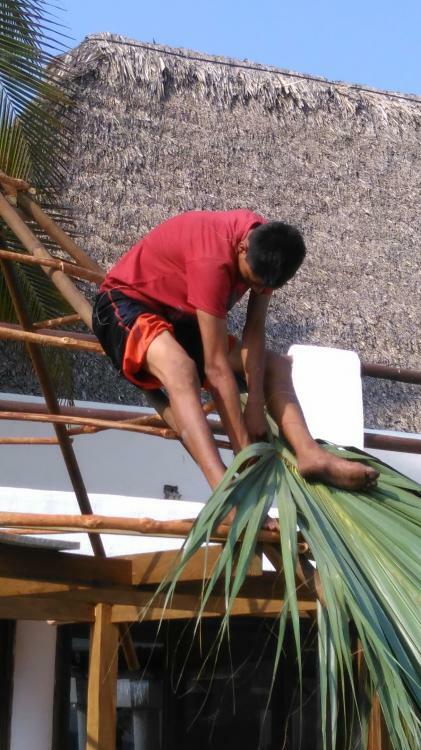 Ive seen two basic methods for installing the fronds. 2. Fold the frond in half vertically and use a nail gun to nail through the frond and the petiole onto the support beam. Option 2 seems a bit easier but maybe a bit tougher to replace down the road. 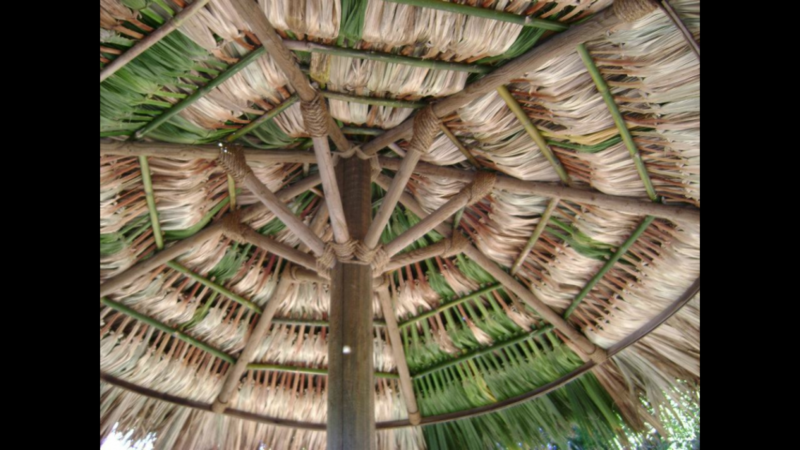 The best fronds for thatching are flat fan palm. 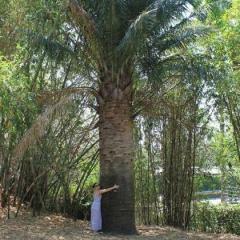 I have found Washingtonia to be excellent. this roof can last 10-15 yrs. (i) Chickees constructed by the Miccosukee Tribe of Indians of Florida or the Seminole Tribe of Florida. As used in this paragraph, the term "chickee" means an open-sided wooden hut that has a thatched roof of palm or palmetto or other traditional materials, and that does not incorporate any electrical, plumbing, or other nonwood features. can you post pictures of the underside of your structure. I'd like to see what type of horizontal boards you used to secure the fronds to. Here is where I am currently, just need a few more support beams than I can lay the horizontal beams (poles, 2x4? Etc) that I will attach the fronds to. thank you for this, very helpful. What do you guys think is an economical way to hold the fronds. In the video they use some small 1" thick boards. I could use the small fence railing boards they sell at home depot but I need alot and that would get pricey. I used 2x6 stringers and 2x4 frame with 1x3 nailing surface. 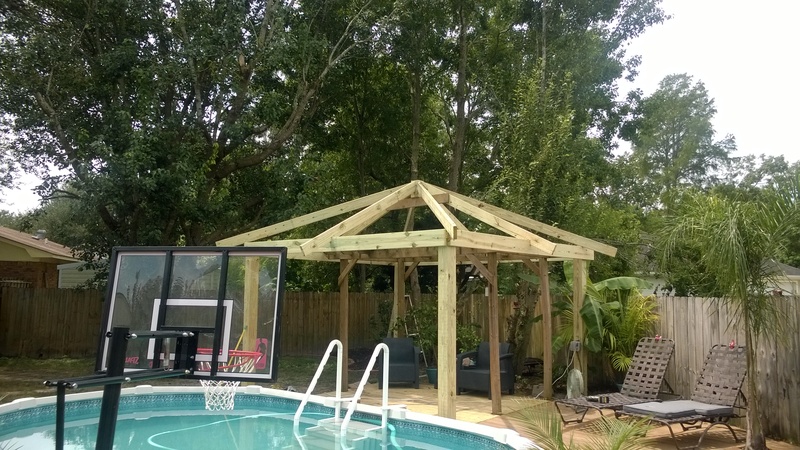 Built a couple on my property with help of a neighbor who has experience ,. He built two very large palapas years ago. The Washingtonia leafs work great and if done right last over 20 yrs ... Needs to be woven tight ! Nice, can you pose a few more pics? 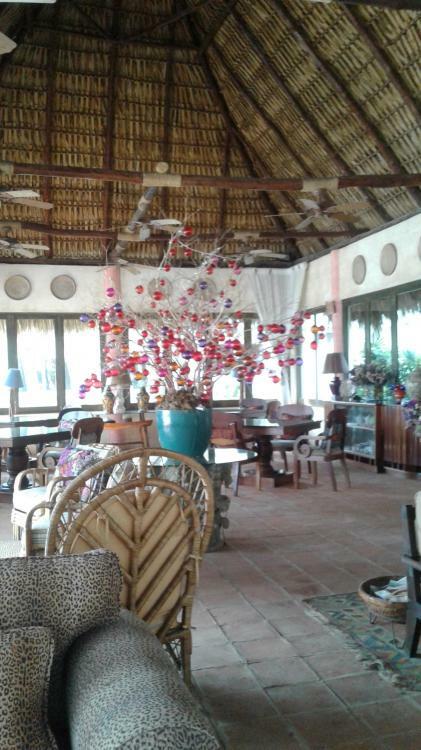 We have several thatched rooves and a rather large ´rancho´, as they´re called here in Guatemala, for our dining-living area and smaller ones for pool side lounging. 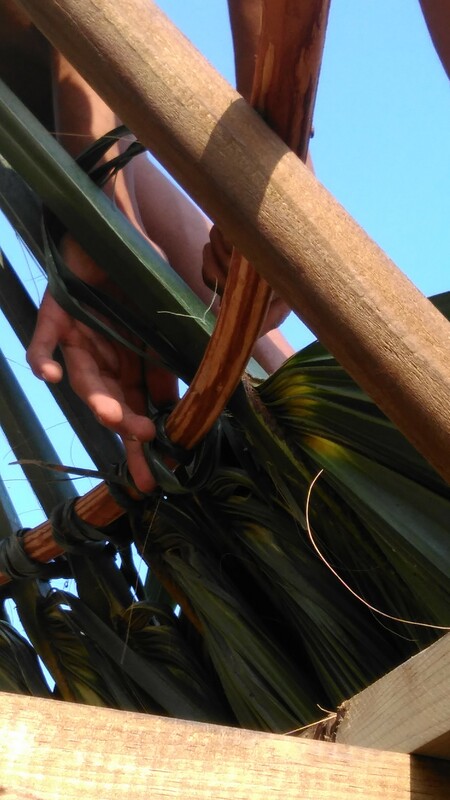 We use Sabal guatemalensis and each leaf is tied on. I don´t have any good pictures but I will check my files. We fold the leaf in thirds AFTER the leaf is tyed on. The outer two or three leaflets of each leaf are twisted together (like twisting your hair) and tied around the round wooden dowels (not more than two inches wide) much like tying a tie. The only ones nailed are the very top and the ones on the corners. They are beautiful and cool and last a very long time except if patching is needed from storm damage or strong winds. Each of the horizontal ´beams´ are about 15 inches separating one from the previous one. As you are tying on the leaves, the petiole actually stretches to the next horizontal beam above the one you´re working on. 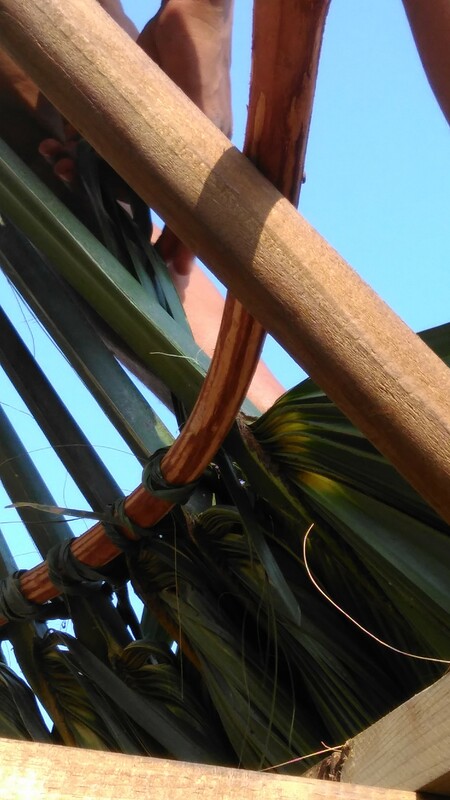 You start thatching at the bottom and work your way up, like Jerry´s photo above, and as you climb, each leaf straddles the one from the row below it and you are effectively securing each leaf on two places on the petiole. The spacing between each leaf is no more than the width of your hand. haha...I hope that makes sense. My father has told me my whole life that FL law only allowed members of the Seminole and Mic. tribes to build chickees. Do I have this right? Must the rest of us in FL obtain approval to build them? Based on these guidelines from Cape Coral, I think you would need to get a building permit. Although that isn't too hard for a simple structure with no utilities. For your horizontal beams you could rip fence pickets in half to save on material cost. thanks for all the replies! I'll post pictures soon, I'm almost ready to start attaching the fronds. It's going to take alot of palms! 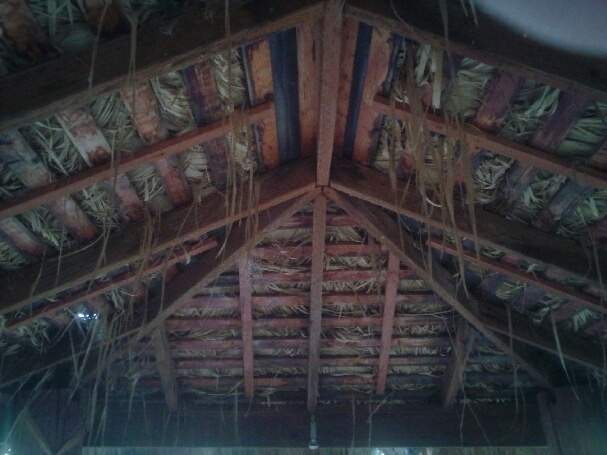 Thatch roof is coming along nicely but there is some form of caterpillar (I think) eating my palm fronds. There are tons of small brown balls on the ground under the thatch and it's all falling into my pool making it a nightmare to keep clean. Can someone recommend an insecticide preferable something I can pick up at the big box store. This is driving me insane. Chickee construction tends to need green leaves and lots of them. There isn't the fine weaving you'd see in those other examples. Some years ago, Fairchild Tropical Gardens had some friends from Ecuador come up to build a traditional thatched structure after making sure local materials would be suitable. Miccosukee and probably Seminole people were invited, too, and apparently everyone had a fine time, with the Garden gaining a useful exhibit, at least until the leaves rotted. There may be some code concerns. A thatch roof on the tiki hut at an upscale Key Largo hotel burned, forcing the hotel to close for extensive renovations (Cheeca Lodge) and a lesser disaster befell a fancy hotel on Key Biscayne. Be aware however that tarantula spiders like to hide in this thatch! Ill be sure not to tell that to my wife lol. If I had to do all over again I would make the roof with a larger pitch. It seemed really tall when I was building it but now that its complete it looks very flat compared to others. I didnt make the fronds tight enough to make it waterproof unfortunately and that really wasnt my goal but now I kinda wish I had. We have a small 4x4 clear tarp at the top to protect the ceiling fan although it is rated for water. But I plan to keep a tv underneath attached to one of the posts so we'll have to figure out the best way to waterproof that. 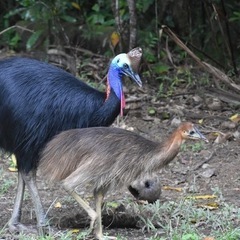 All in all very fun project, hopefully even with the low pitch the fronds last a few years.